Father, Your voice calls to the deep places within us, the places we would like to keep buried beneath the surface. But your voice calls as waves crash breaking up the ground until we surrender our will and allow you into the depths of our hearts. Even though the hard waves break against our shores, you surround us with your lovingkindness and sing your song of love over us. Lord, as the participants are coming in Hawaii for Hawaii’s first Deeper Still retreat being held this week, may the beauty of your creation sing over them and remind them of your lovingkindness as deep calls unto deep. Give them beauty for ashes. In Jesus’ Name, Amen. Psalm 42:7 sounds like a sweet verse until the context of the entire Psalm is read. The Psalmist was in distress when he wrote this verse. Have you ever been to the ocean? Waves and billows are not nice and comfortable blankets of deliverance. Waves are violent and billows are heaps, strong and fierce. Some translations have the beautiful word of “waterfalls” instead of “waterspouts.” Waterfalls sound tranquil and soothing, but again, waterfalls may sound peaceful, but they are dangerous and powerful. The word “waterspouts” is a water conduit, or a pipe through which water flows. The deep parts of the Lord call to the deep parts within us. His voice calls to those places buried deep within us through this water conduit or pipe. When the waves have crashed over us again and again and we feel as if we may be consumed by the billows as they roll continually over us, we can hear the Lord’s voice calling. He will command His lovingkindness in the daytime and sing His song over us in the night for He is the God of life. He is the One who calls the seas to still and calms the crashing waves. Only He can silent the storms of our souls. The first Deeper Still retreat is being held in Hawaii this week. The retreat begins Tuesday, Nov 27 and ends Nov 29. It is only three days, but much can happen in only three days. Psalm 42:7-8 also reminds me of how volcanos erupt. Magma is under the surface until pressure is applied and it rises to the top and spews out as lava. The magma was always there under the surface but it does not rise to the top until the conditions are right. The pain in our hearts from the wounds of abortion can act like magma. The wounds are there and when pressures come, the pain cannot be contained any longer. The pain spews out in destructive ways and hurts whatever is in its path. However, there is hope. Just as the flow of lava lays the foundation for a beautiful tropical island, the ashes of our pain births beauty. If the magma never surfaced, we would have missed the beauty. And if the waves and billows would not have crashed over us, we would have missed the voice of the Lord calling deep unto deep from the waterspout. Waterfalls are beautiful but powerful and relentless, like our God. Waterfalls, waves, billows, lava are not gentle, they are dangerous. But all create beauty. As you work through the pain of abortion-wounds or other wounds in your life, may you find hope as this Psalmist did, that there is beauty on the other side of this pain and the Lord will command His lovingkindness and sing songs of deliverance in the night. The waves, lava and the night won’t last forever, this is His promise. 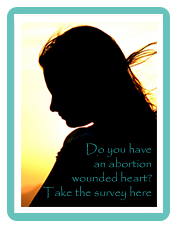 If you have an abortion-wounded heart, there is hope. Go to www.godeeperstill.org to see where the closest retreat is to you.